After you have created a chart in Excel, what's the first thing you usually want to do with it? Make the graph look exactly the way you've pictured it in your mind! 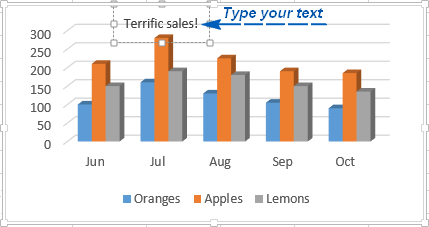 In modern versions of Excel 2013 and Excel 2016, customizing charts is easy and fun. Microsoft has really made a big effort to simplify the process and place the customization options within easy reach. And further on in this tutorial, you will learn some quick ways to add and modify all essential elements of Excel charts. 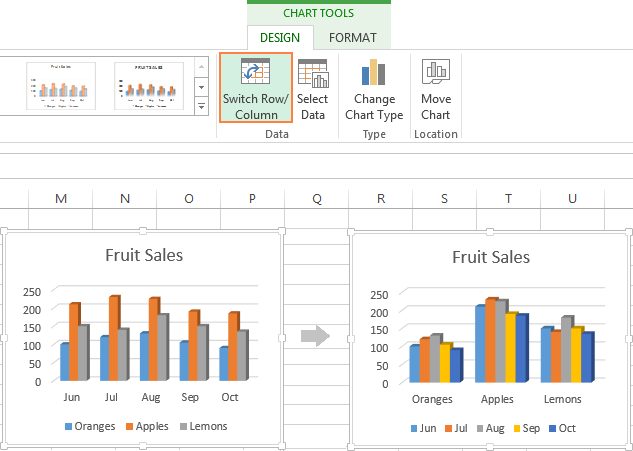 Select the chart and go to the Chart Tools tabs (Design and Format) on the Excel ribbon. 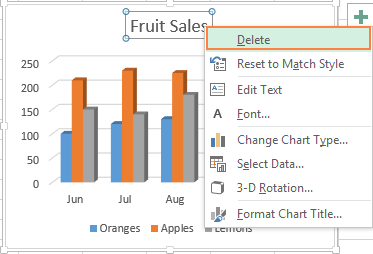 Right-click the chart element you would like to customize, and choose the corresponding item from the context menu. 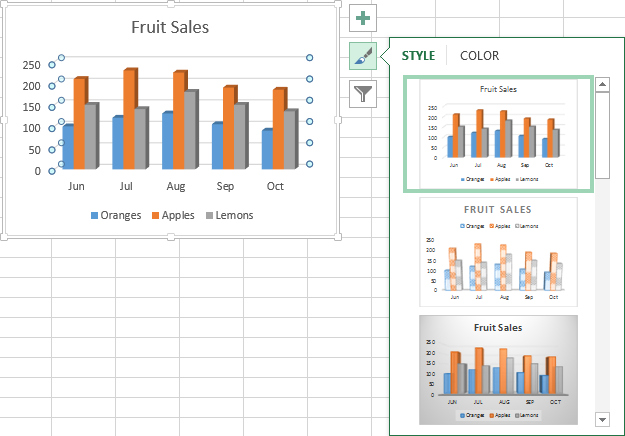 Use the chart customization buttons that appear in the top right corner of your Excel graph when you click on it. Even more customization options can be found on the Format Chart pane that appears on the right of your worksheet as soon as you click More options… in the chart's context menu or on the Chart Tools tabs on the ribbon. Tip. For immediate access to the relevant Format Chart pane options, double click the corresponding element in the chart. 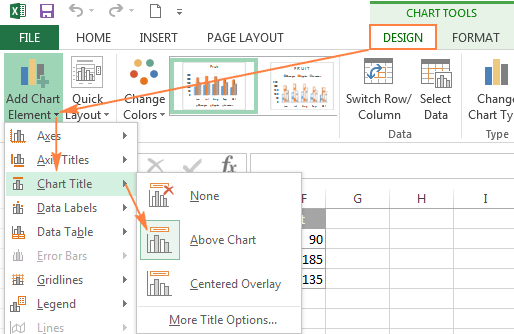 Armed with this basic knowledge, let's see how you can modify different chart elements to make your Excel graph look exactly the way you'd like it to look. This section demonstrates how to insert the chart title in different Excel versions so that you know where the main chart features reside. 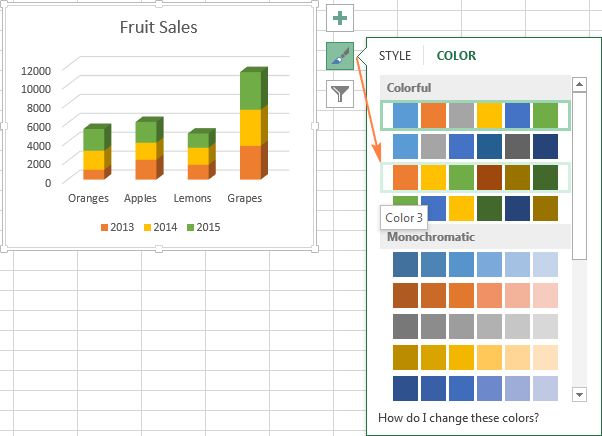 And for the rest of the tutorial, we will focus on the most recent versions of Excel 2013 and 2016. You can also link the chart title to some cell on the sheet, so that it gets updated automatically every time the liked cell is updated. The detailed steps are explained in Linking axis titles to a certain cell on the sheet. If for some reason the title was not added automatically, then click anywhere within the graph for the Chart Tools tabs to appear. Switch to the Design tab, and click Add Chart Element > Chart Title > Above Chart I (or Centered Overlay). Or, you can click the Chart Elements button in the upper-right corner of the graph, and put a tick in the Chart Title checkbox. 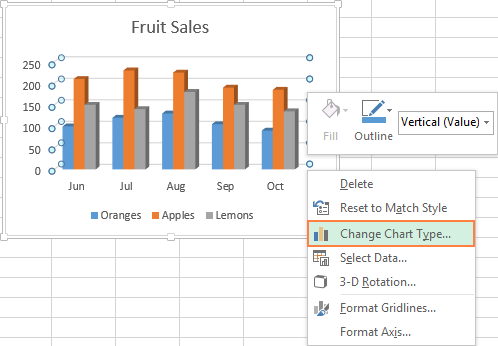 Above Chart - the default option that displays the title at top of the chart area and changes the graph's size. Centered Overlay - overlays the centered title on the chart without resizing the graph. For more options, go to the Design tab > Add Chart Element > Chart Title > More Options. Clicking the More Options item (either on the ribbon or in the context menu) opens the Format Chart Title pane on the right side of your worksheet, where you can select the formatting options of your choosing. 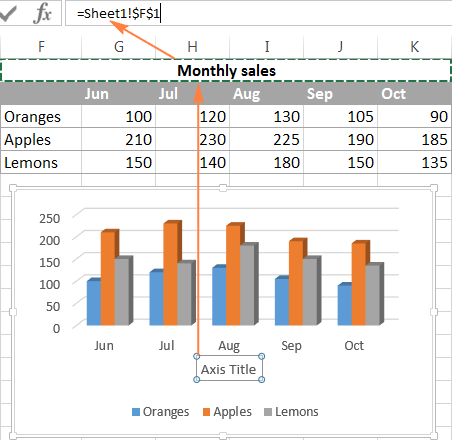 To add a chart title in Excel 2010 and earlier versions, execute the following steps. 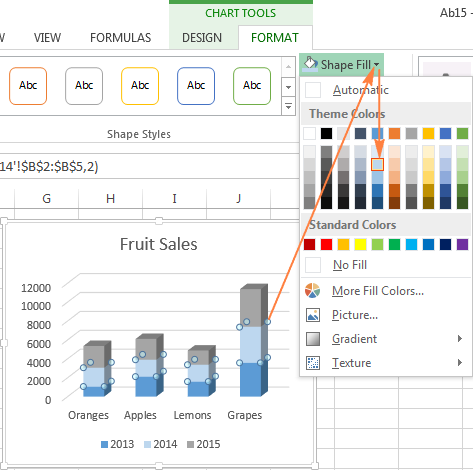 Click anywhere within your Excel graph to activate the Chart Tools tabs on the ribbon. On the Layout tab, click Chart Title > Above Chart or Centered Overlay. 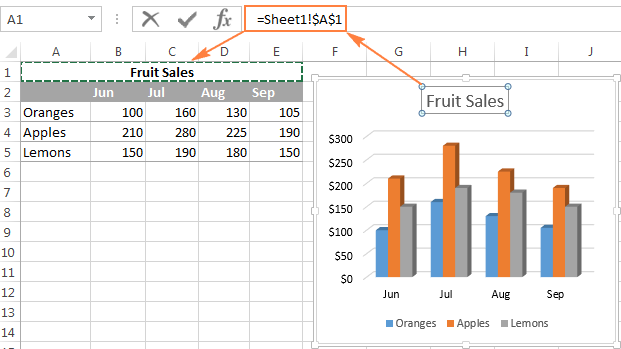 For most Excel chart types, the newly created graph is inserted with the default Chart Title placeholder. To add your own chart title, you can either select the title box and type the text you want, or you can link the chart title to some cell on the worksheet, for example the table heading. In this case, the title of your Excel graph will be updated automatically every time you edit the linked cell. On your Excel sheet, type an equal sign (=) in the formula bar, click on the cell that contains the needed text, and press Enter. In this example, we are linking the title of our Excel pie chart to the merged cell A1. You can also select two or more cells, e.g. a couple of column headings, and the content of all selected cells will appear in the chart title. On the Design tab, click Add Chart Element > Chart Title > None. On the chart, right-click the chart title, and select Delete in the context menu. 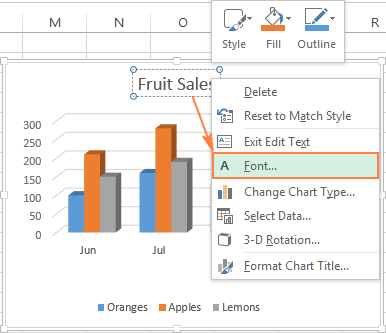 To change the font of the chart title in Excel, right-click the title and choose Font in the context menu. The Font dialog window will pop up where you can choose different formatting options. In the same way, you can change the formatting of other chart elements such as axis titles, axis labels and chart legend. 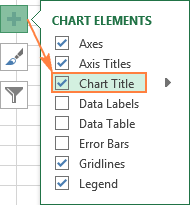 For more information about chart title, please see How to add titles to Excel charts. 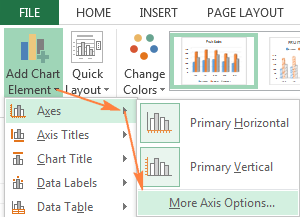 For most chart types, the vertical axis (aka value or Y axis) and horizontal axis (aka category or X axis) are added automatically when you make a chart in Excel. You can show or hide chart axes by clicking the Chart Elements button , then clicking the arrow next to Axes, and then checking the boxes for the axes you want to show and unchecking those you want to hide. Click the axis title box on the chart, and type the text. To format the axis title, right-click it and select Format Axis Title from the context menu. The Format Axis Title pane will appear with lots of formatting options to choose from. You can also try different formatting options on the Format tab on the ribbon, as demonstrated in Formatting the chart title. As is the case with chart titles, you can link an axis title to some cell on your worksheet to have it automatically updated every time you edit the corresponding cells on the sheet. To link an axis title, select it, then type an equal sign (=) in the formula bar, click on the cell you want to link the title to, and press the Enter key. 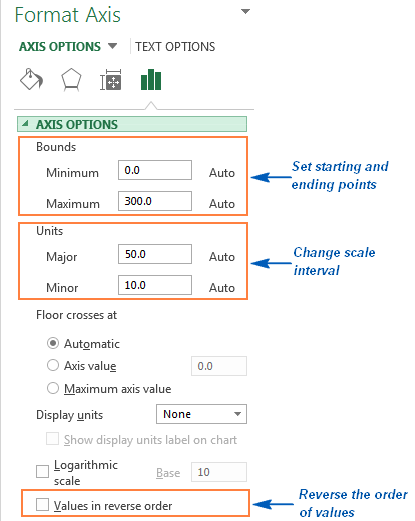 Microsoft Excel automatically determines the minimum and maximum scale values as well as the scale interval for the vertical axis based on the data included in the chart. However, you can customize the vertical axis scale to better meet your needs. 1. Select the vertical axis in your chart, and click the Chart Elements button . 2. Click the arrow next to Axis, and then click More options… This will bring up the Format Axis pane. To change the scale interval, type your numbers in the Major unit box or Minor unit box. To reverse the order of the values, put a tick in the Values in reverse order box. Tip. To revert back to the original number formatting (the way the numbers are formatted in your worksheet), check the Linked to source box. 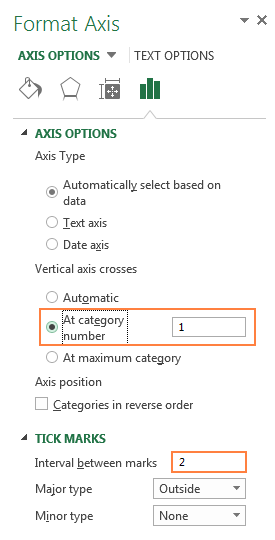 If you don't see the Number section in the Format Axis pane, make sure you've selected a value axis (usually the vertical axis) in your Excel chart. 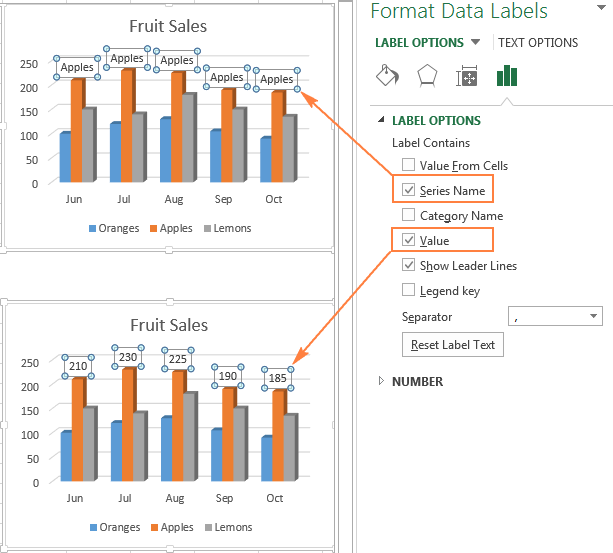 To make your Excel graph easier to understand, you can add data labels to display details about the data series. Depending on where you want to focus your users' attention, you can add labels to one data series, all the series, or individual data points. Click the data series you want to label. To add a label to one data point, click that data point after selecting the series. Click the Chart Elements button, and select the Data Labels option. For specific chart types, such as pie chart, you can also choose the labels location. For this, click the arrow next to Data Labels, and choose the option you want. To show data labels inside text bubbles, click Data Callout. 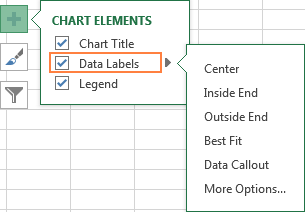 If you decide that too many data labels clutter your Excel graph, you can remove any or all of them by right-clicking the label(s) and selecting Delete from the context menu. To change the position of a given data label, click it and drag to where you want using the mouse. To change the labels' font and background color, select them, go to the Format tab on the ribbon, and choose the formatting options you want. 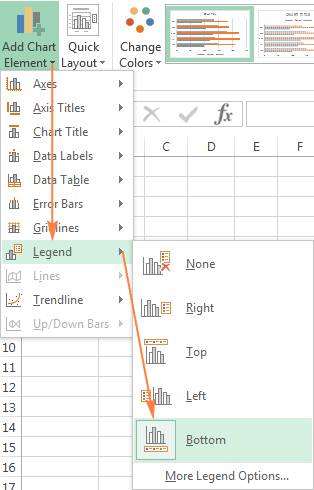 When you create a chart in Excel, the default legend appears at the bottom of the chart in Excel 2013 and Excel 2016, and to the right of the chart in Excel 2010 and earlier versions. To hide the legend, click the Chart Elements button in the upper-right corner of the chart and uncheck the Legend box. To move the chart legend to another position, select the chart, navigate to the Design tab, click Add Chart Element > Legend and choose where to move the legend. To remove the legend, select None. Another way to move the legend is to double-click on it in the chart, and then choose the desired legend position on the Format Legend pane under Legend Options. To change the legend's formatting, you have plenty of different options on the Fill & Line and Effects tabs on the Format Legend pane. In Excel 2013 and 2016, turning the gridlines on or off is a matter of seconds. Simply click the Chart Elements button and either check or uncheck the Gridlines box. Microsoft Excel determines the most appropriate gridlines type for your chart type automatically. 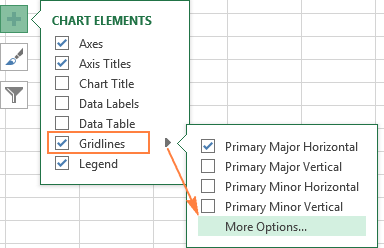 For example, on a bar chart, major vertical gridlines will be added, whereas selecting the Gridlines option on a column chart will add major horizontal gridlines. To change the gridlines type, click the arrow next to Gridlines, and then choose the desired gridlines type from the list, or click More Options… to open the pane with advanced Major Gridlines options. When a lot of data is plotted in your chart, you may want to temporary hide some data series so that you could focus only on the most relevant ones. To do this, click the Chart Filters button on the right of the graph, uncheck the data series and/or categories you want to hide, and click Apply. To edit a data series, click the Edit Series button to the right of the data series. The Edit Series button appears as soon as you hover the mouse on a certain data series. This will also highlight the corresponding series on the chart, so that you could clearly see exactly what element you will be editing. If you decide that the newly created graph is not well-suited for your data, you can easily change it to some other chart type. Simply select the existing chart, switch to the Insert tab and choose another chart type in the Charts group. Alternatively, you can right-click anywhere within the graph and select Change Chart Type… from the context menu. 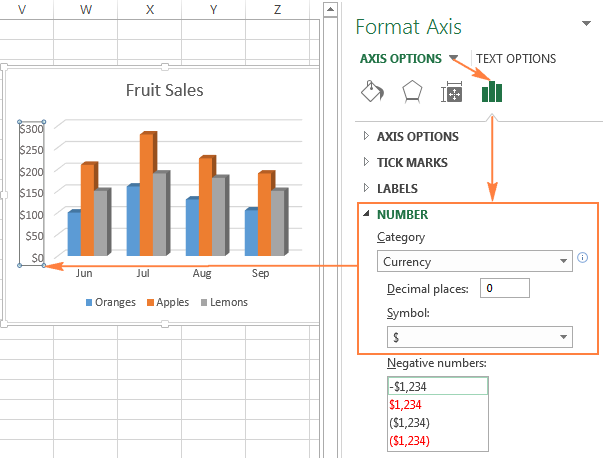 To quickly change the style of the existing graph in Excel, click the Chart Styles button on the right of the chart and scroll down to see the other style offerings. 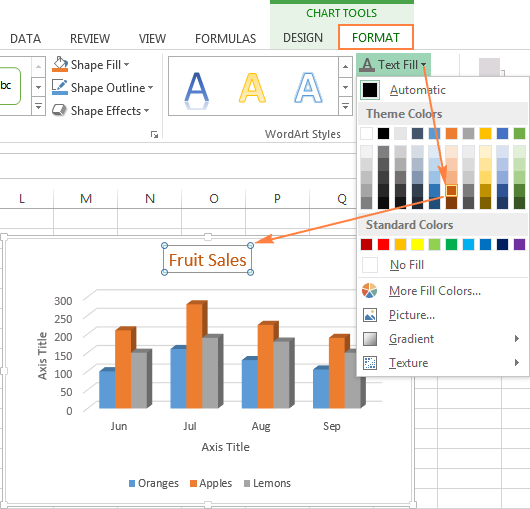 To change the color theme of your Excel graph, click the Chart Styles button, switch to the Color tab and select one of the available color themes. Your choice will be immediately reflected in the chart, so you can decide whether it will look well in new colors. 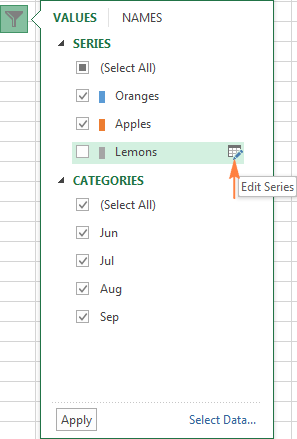 When you make a chart in Excel, the orientation of the data series is determined automatically based on the number of rows and columns included in the graph. In other words, Microsoft Excel plots the selected rows and columns as it considers the best. If you are not happy with the way your worksheet rows and columns are plotted by default, you can easily swap the vertical and horizontal axes. To do this, select the chart, go to the Design tab and click the Switch Row/Column button. Have you ever made a graph in Excel only to find out that data points appear backwards from what you expected? To rectify this, reverse the plotting order of categories in a chart as shown below. 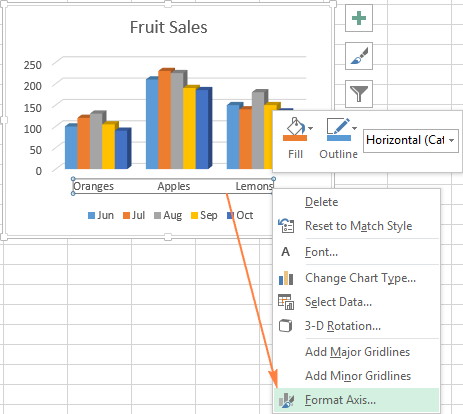 Right click on the horizontal axis in your chart and select Format Axis… in the context menu. Either way, the Format Axis pane will show up, you navigate to the Axis Options tab and select the Categories in reverse order option. Apart from flipping your Excel chart from left to right, you can also change the order of categories, values, or series in your graph, reverse the plotting order of values, rotate a pie chart to any angle, and more. 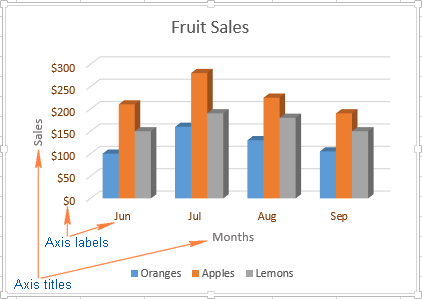 The following tutorial provides the detailed steps on how to do all this: How to rotate charts in Excel. This is how you customize charts in Excel. Of course, this article has only scratched the surface of Excel chart customization and formatting, and there is much more to it. In the next tutorial, we are going to make a chart based on data from several worksheets. And in the meanwhile, I encourage you to review the links at the end of this article to learn more. 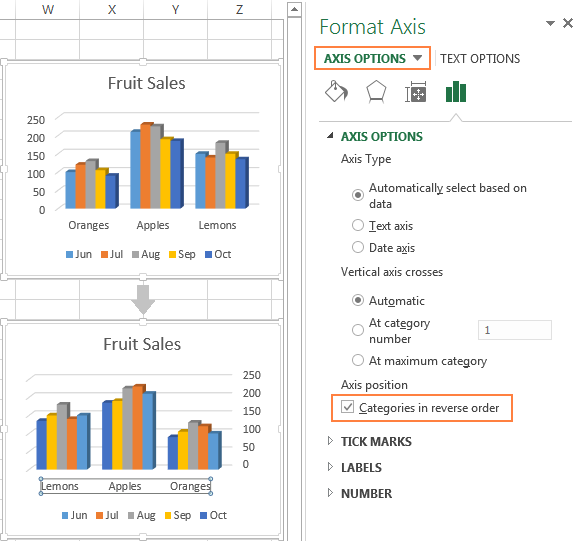 31 Responses to "Customizing Excel charts: add chart title, axes, legend, data labels and more"
I like the way you use arrows to show the sequence of clicks needed to get to a menu item. I am going to borrow that idea! How can I change text in the legend? 1. Right-click the legend, and choose Select Data in the context menu. 2. In the Select Data Source dialog box, under Legend Entries (Series), select the legend entry that you want to change, and click the Edit button, which resides above the list of the legend entries. 3. In the Series Name box, type either the reference to the cell that contains the desired text, or the legend name that you want to use. Hi I am stumped. I have graphs in the same file on several different tabs. The horizntal axis is dates that I want to be able to select a minimum and maximum at will. For the graph on one tab when I right click on the horizontal axis I can see the "Bounds" field with min and max listed under Axis Options so it is easy to change the min and max date fields. For the graph on the next tab, I cannot see the "Bounds" listed under Axis Options. Gotta believe I am missing a simple setting somewhere. OK here is the answer an excel guru found for me. The Bounds will only appear in the Format Axis drop down if there are no n/a or multiple data types in the source data; ie dates and numbers. Once I cleaned the data problem solved. thanks much. I have an additional question: How can the axis be fixed and not change when being copied and other data is being entered? e.g. I have one graph showing the amount of people in street A, axis bound goes from 1 to 100. I copy this graph (in order to keep the layout) and enter the amount of people in street B, axis bound modifies itself automatically from 1 to 5, but I want it to stay from 1 to 100. 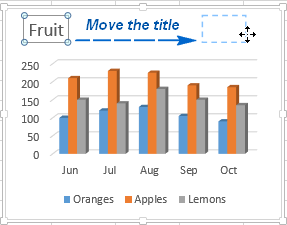 Is there any way to change the chart axis title from all upper case to lower case as the upper case comes by default when I create 'Line with marker' Line graph in excel. In Excel how do you put the percent along the top (...the is horizontal bar chart) and then add data labels and make the number (...not the percent)? In Excel, how do you put the percent along the top (...this is a horizontal bar chart) and then add data labels and make the data labels numeric (...not the percentage)? I have a bar graph showing actual sales, with a line for the target. I am showing data for the entire year, even though we have only 4 months completed - the reason for this is to show the line as to where we are at to target. (we do this for every salesperson so they know where they are at to target. what I would like to do, is fade out the bars for the months that we haven't got to yet. Or change the formatting of the remaining months from my data, so that it would look different for those remaining months. Does anyone know how to stop the removal of formatting when saving as text in another file? Im trying to save a chart as a template to a set size, but when I open the chart from templates it reverts back to standard size, how can I fix this? Is there a way to make the reverse value of axis order dynamic? Thanks to all these great blog entries, I have a dynamic chart that displays different data based on a pulldown option (counts or amounts). Counts display in the helper table as positive integers, and amounts display as negative decimals, with custom format to display as currency. When I graph the data, the vertical axis shows proper logical stacking (0 upward to high value) for the counts, but amounts descend from the top (0) down to the low maximum (-$1M). If I choose inverse order when graphing the amounts, switching back to counts now shows the counts descending from the top of the chart. I'd like to only invert the order when the pulldown reads "amounts" (or values are negative). Negating the helper table values can be troublesome, since I use the negative amount to format the vertical axis (positives display as integers, negatives display as currency). Thank you all so much for the blog. hey - great article! what do you do when you cannot edit the Legend Entry in the Select Data Source? I can see the buttons to click on to Edit/Add/Remove but they remain greyed out...? I know that we can change the position of Data Labels but Can we change the colour of Data Labels? - Click on data labels in the chart to select them. - Go to the Chart Tools > Format tab. - In the WordArt Styles group, click the Text Fill button and select the desired color. Can you write a macro or formula to include the data into the legend next to the series name? For the legend, the labels default to 'Series 1', ,Series 2' and so on. How can specific names be allocated to replace 'Series 1', 'Series 2' and so on? 2. In the Select Data Source box, click on the legend entry you want to change, and then click the Edit button. 3. The Edit Series dialog window will show up. The Series name box contains the address of the cell from which Excel pulls the label. You can either type the desired text in that cell, and the corresponding label in the chart will update automatically, or you can delete the existing reference and type the reference to another cell that contains the data you want to use as the label. Hello, first thanks for this blog it has been very helpful from lately, I have a question regarding 2D Surface area graphs, as I created the graph, the legends are created automatically giving different colored rangers from (0-10 , 10-20 , 20-30, and 30-40) I waant to change these legend ranges (excel 2010) can you help me with this please? Thanks! Your explanation and flow of information attracted too much. Here I have one question. How to fix the major grids for the data set.